Laminitis is not a condition I see often in Metal horses. Metal horses are not as prone to obesity or metabolic issues as other temperament types. Laminitis in a Metal horse temperament is more likely to be of the mechanical variety. 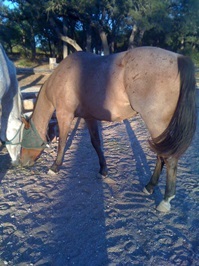 Mechanical laminitis occurs when there is inflammation created secondary to chronic bruising from hard or rocky ground. Chronic wet conditions can soften the sole and make it more susceptible to bruising. Metal horses are also more susceptible to damage from bruising because they have a high pain threshold and don’t pay attention to where they put their feet. Cooper, a Metal horse, developed laminitis after combination of wet weather, high sugar grass and a change in his supplement plan. Cooper is on a high fat diet that is good for a Metal horse. The beneficial bacteria in the large intestine thrive on a high fat diet. The challenge with feeding fat to a Metal horse is weight gain. Rice bran is a good fat and carbohydrate source for a hard working Metal horse but a pleasure horse won’t need the extra calories. Chia seeds are perfect for the Metal horse in that they give the quality fat needed by the good bacteria and they provide extra protein and minerals but no carbohydrates. Cooper was not overweight so he was getting 2 cups of rice bran daily but no chia seeds. His mother, an Earth/Metal horse temperament type, tends to be overweight so she was on 1 cup rice bran and 1/4 cup chia seeds a day. Kate gets a maintenance probiotic/blue green algae supplement and Cooper normally is on a probiotic/enzyme/algae supplement that gives him more probiotic support. Unfortunately, Cooper was out of his supplement for a few weeks before his laminitis episode. Even though Cooper and Kate are on the same pasture and Kate is heavier Cooper was the one with the sore feet. I suspect the omega 3 fatty acids and minerals in the chia and algae gave extra strength to Kate’s hooves during the wet weather. Cooper is now on a double dose of 2 packs a day of his probiotic/ enzyme/ algae supplement and 1/2 cup chia seeds have been added to his program. You only need 1/4 to 1/2 cup of nutrient dense chia seeds a day so this small amount does not increase weight gain. Expect to see your Metal horse’s hooves and coat improve, as well, with the nice ratio of omega 3 to omega 6 fatty acids in the chia seeds. Omega 3 fatty acids are also good in the blue green algae to offer a good anti-inflammatory action. Cooper has to wear a muzzle to slow down his consumption of high sugar grass and acorns but he is already moving better and should have no long term damage from his mild episode of mechanical laminitis. If you haven’t checked out our new website, please do so. It was designed to make it easier to find all the great resources we’ve always offered and easier to shop for your horse supplement needs. The new site is mobile friendly so you can shop right from your phone, tablet or computer. Just surf on over to www.holistichorsekeeping.com for answers to your holistic horse care and horse temperament type questions or find us on Facebook pages for Holistic Horsekeeping or Horse Harmony. This entry was posted in Five Element Feeding, Laminitis, Newsletters and tagged holistic horse care, holistic horse health, horse temperament, Laminitis, Metal horse on September 15, 2016 by Madalyn Ward, DVM.